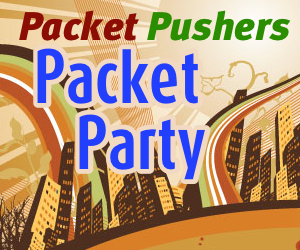 Packet Pushers had a Packet Party in Feb 17, 2012 with an Open Microphonr. The Packet Party was recorded live from event where we had about 90 people on the call. People from the audience would ask questions, and we throw to topic open for discussion. Overall the discussion was great, and we covered a lot different topics. Please let us know if you enjoyed this format. Depending on the feedback, we will look to schedule more shows in the future.